Rising like a dusty mirage out of the Karoo heat, there’s a city that many call home. A manifestation of our collective imagination, the culmination of our collective efforts. It comes and goes, and ebbs and flows. It’s transient, temporary and transitory. It’s neither here, nor there. It is real in its unrealness. It’s a collection of differences where we discover the secrets of ourselves that have been kept hidden. Where we uncover hidden strengths and talents, and where we expose our weaknesses and our shortcomings. An experiment with echoes of the past and explosions of the future. Ephemerality, in nature, art, in human activity, leaves potent imprints: a temporary lake, a flash flood, the one night a year that the baobab flowers, a sand mandala, an avenue of cherry blossoms, a sand sculpture washed away by the ocean, land art, a masterpiece drawn in chalk on a road disappearing after the rain, a performance, fireworks, a giant wooden sculpture released through fire. Fleeting moments carry great power… “did that actually happen?”. A trace is left on our psyches. Every city is temporary. Contemplate the cosmopolitan historical city states of Munamatapa, Mapungubwe, Samarkand and Tenochtitlan – and explore the fantasy cities of Xanadu, Mega-City One, Atlantis and Tatooine. In the space where something teeters on the edge of existing there is a tangible change in people, in the air, in the world. We speak differently. We value differently. We walk differently – our demeanour and thoughts altered by an automatic, primal reverence of a single idea: when this is gone, it is gone forever. The moment this one, unique, beautiful object, being or moment is gone, nothing will fill the space it once occupied. When this disappears, there is nothing left. Nothing. Within this gathering hidden in the Tankwa desert we find a space we can explore all the aspects of ourselves that we would never have imagined in the presence of abundance. A space where we can discover what we truly value. A space we can discover who we are in relation to something so meaningful yet so fleeting. A week in which to learn to do things differently. It could be the last time you experience Tankwa Town, and you would have no idea. Circumstances may change, and you may find that you’ll never visit again. Think of an AfrikaBurn where every piece of art, every project, and every effort is made knowing it could be the last of it’s kind. What would you do? What would you create? What would you celebrate and dance for? What would you worship? What would you lament? What would you laugh at? Sinking into the sands of time; every camp packed, and every vehicle dismantled, this city we manifested will disappear, remaining only in our minds. What a beautiful, astounding, priceless thing. A rainbow fallen and an anthem stilled. How was the theme arrived at? New concepts and developments of pre-selected themes were submitted by members of our community following the call-out for theme submissions in May. Thereafter, members of our Theme Team sat with the content and mulled it over, until a clear direction emerged. A call for theme proposals is announced through our various channels (the newsletter, Facebook and Twitter). All proposals are collated and have the proposers names taken off the document so as to make it anonymous. 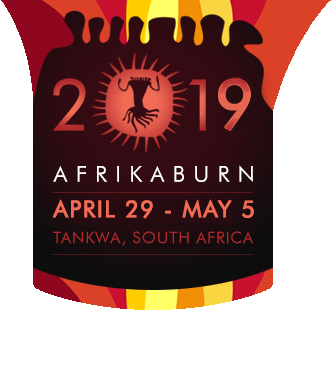 The Theme Team convenes and discusses what we think AfrikaBurn “needs” as a rallying point in the next round. We come to agreement on the look & feel. After that, we go through the proposed themes and choose an appropriate short list. At the same time we ask for input from Members and the Operations team, this is optional for these teams, but we often get nice input. We mull on it and reconvene and discuss more. Write up and fine tune the theme development. Go to Tankwa and make fabulous things. Who was The Theme Team for 2019? Monique Schiess, Lorraine Tanner, Robert Weinek, Werner Strauss, Gregory Hayley, Samantha Bendzulla, The Tim Doyle, Dale Calder, and Chris Denovan. Where did the ideas spring from? The rationale includes writing and ideas from Keir Tetley, Travis Lyle, Monique Schiess, The Tim Doyle and some anonymous submissions. What have past themes been from 2007 to date? See this page.